On September 20, President Rouhani gave wide-ranging comments on the nuclear deal and regional conflicts. 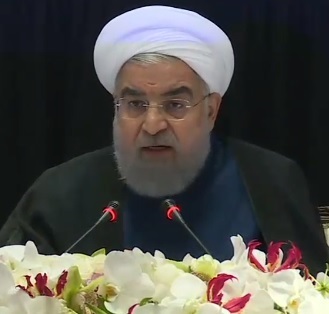 In a press conference following his U.N. address, the Iranian leader rejected outright any prospect of renegotiating the nuclear deal or extending its timelines. “There will be absolutely no changes, no alterations, nothing done to the current framework of the JCPOA (Joint Comprehensive Plan of Action),” Rouhani said. He also responded to allegations that President Trump raised in his U.N. address. The following are excerpted remarks as translated by an Iranian interpreter and arranged by topic. Vis-a-vis the JCPOA, you're all quite keenly aware that this agreement is a multi-lateral agreement between seven countries, which has received support and the ratification of many other countries. In other words, above and beyond the three parties of the European nations present, there was also the High Representative for Foreign Policy from the European Union at every meeting and at the onset of the agreement. And the European Union in aggregate, which would constitute 30 some odd countries, were participants and supporters of this agreement. It took many months. It took a very long time because of the importance of this dialogue. Because of the importance of this negototiation. Because of the importance of every single word that comprises the totality of this agreement and all of the countries and nations agreed to every word of this agreement. Following which the United Nations Security Council, with Resoultion 2231, expressed its full support and agreement to it as well. Therefore the JCPOA is not a bilateral agreement. It does not even resemble the Paris Climate Accord. It is an agreement that has been approved by the UN Security Council and this agreement plays a very important role in international security, as well as regional security. In our opinion, any country that takes the first step in violation of this agreement, not only it shows that it has broken its promise and is of questionable character. Therefore it has opened, unwillingly perhaps, the door to a lack of trust. There is no country anywhere in the world, and there are no leaders of countries today, and you can listen to the speeches delivered at the UN General Assembly, and you will keep hearing these speeches in the next few days. There were only two people whom expressed discontent to say the least, and expressed, as they said, shame for this agreement. If you put these two people aside, over 190 countries, every single speaker who participated in the General Assembly says that this is the best agreement possible. Logic will say the same. The benefit of the international community will say the same. And non-proliferation and the support of the non-proliferation treaty will say the same. Then laying the foundation for progress of relationships throughout the region and the world, is seeking the same. Therefore, I really don't know whether a country or an individual tries to back out of this agreement, other than embarassment upon themselves, they will gain nothing from it. If the United States government exits the agreement, undoubtedly it will be condemed by the American people themselves. And before that, by the European Union. By all countries throughout the world. The condemnation will be equal. And even the allies of the United States will no longer have the courage to support America vis-a-vis this issue, because breaking an agreement and the commitment necessary to such an important agreement is not something that can be defensible. And I don't know, other than bringing happiness and joy to a regime, to any legitimate regime in our region, who else can feel joy and happiness at this? For the United States, for the new administration in the United States to take such a step in breaking this agreement. Therefore, it is not beneficial. It does not benefit anyone. And these are just rhetoric and slogans, which will perhaps continue. But, if under any conditions, the United States chooses to break this agreement, it means that the hand of Iran, for any choice and any option, has been left open. If anyone exits this agreement and breaks the commitments of the agreement, and violates this agreement, it means that our hand is completely open to take any action that we see as beneficial to our country. And the country, as a whole, decides on that step. So, that means the removal of obstacles for us. So, if the new officials in the United States believe that the violation of the JCPOA will bring pressure on Iran, then you can say that they are completely and absolutely mistaken in their political equations. The exiting of the United States of America from the JCPOA will not benefit them in the slightest. The position of Iran throughout the world will be stronger and better than before. And the government of the United States, under the pressure of public sentiments from throughout the world, will not see any benefit. We have talked extensively in Tehran about this. And we will continue to talk about this. And we have envisioned various scenarios. And our hand is completely open for options and choices. For years we spoke and negotiated for one agreement. And in the last few years, there were extremely tough conversations and dialogue and negotiations that took place with the 5+1 countries, including the United States of America. So after having reached an agreement for years, and having obtained and ratified the agreement, but we see today, that the Americans are seeking an excuse in order to break this agreement, what possible or logical reason would we have to talk them about any other issues? Not only we wouldn't be able or willing to talk to them about other issues, but I do believe that if the United States of America breaks the commitments under the JCPOA, no other government in the future would ready and willing to talk or negotiate with the United States of America. Because, an American government that chooses to trample upon her legal and legitimate international commitments, a conversation or negotiation with such a government would be a waste of time. In addition to which, yesterday Mr. Trump was extremely offensive to the people of Iran and before anything we are waiting for Mr. Trump to issue an apology to the people of Iran. In the conversations held with European leaders, including the two countries that were present in the 5+1 negotiations, in other words France, with President Macron, and Prime Minister May from Great Britain, and other European leaders as well, such as Belgium, Norway, Sweden and other European countries, their pronouncement was that the JCPOA was the best possible agreement that was reached. It must be preserved. And all of our efforts, they maintained, will be brought to bear for the preservation of this agreement. And there is no other solution above and beyond the JCPOA, because this was a very complicated problem that needed to be resolved. Therefore, the Europeans clearly, and without any doubts, support the JCPOA. And during conversations with me they had told me that they had expressed clearly their opinions and intents to the United States. And also asked the United States to remain faithful to her commitments under the framework. I do believe that the priority of all of the European counterparts in the 5+1, as well as Iran, is to preserve this agreement, because it is to everyone's benefit. But if it cannot be preserved, what will happen then is a very important question that we are analyzing, as well as the European Union and other partners in this field are analyzing and holding talks about under those conditions, if they were to come to pass, then we would certainly see what would happen. Well, Iran, vis-a-vis this issue, if confronted in reality with this issue, it will have various options and choices. One important aspect of the issue will be the type of reaction of the European Union should this come to pass. In the past, in the United States in the 90s, we did experience somewhat similar problems with the Americans even back then. Under the Clinton presidency, they were seeking to implement an extra territorial law against Iran, and the European Union stood steadfast against such an initiative and announced to the investors and banks that it will absorb and be held responsible for political risks. So it did absorb that risk and it defeated the American plan. And European investors and European enterprises came and invested heavily in our petroleum and gas industry. So the Americans were defeated, vis-a-vis that particular initiative. So the Europeans, dependent upon the actions that they take in the future, it will be very effective as far as the decisions that we make subsequently. The issue of the JCPOA is a closed issue. There is no return, renegotiation, or changes vis-a-vis this agreement. It is an agreement, which took over two years of negotiation over every single word and every single sentence. And most of the time, was taken days and weeks and months of negotiations and dialogue was spent on dates. Of course the dates, we insisted, they be the shortest possible and the other side insisted that they'll be as long as possible. We were able to agree on mutually acceptable dates and deadlines. So this agreement is not something that someone can touch. This is a building, from the frame of which, if you take off a single brick the entire building will collapse. So this issue must be understood by American officials and really erase these unrealistic thoughts from their minds. Either the JCPOA will remain as is, in its entirety. Or, it will no longer exist. There will be absolutely no changes, no alterations, nothing done to the current framework of the JCPOA. Normally, the [JCPOA ministerial] meeting is held every few months upon request by countries, this commission does take place, as it is taking place today, at the ministerial level. We have a lot of complaints. We have complaints of some of our European friends, when it comes to some banking issues, they have not acted upon those issues as we would have liked them to. And our most important complaint is to the United States government because on a daily basis they are seeking to exit and break the agreement and one of those complaints is the speech of the United States president yesterday. Because it did not go in accordance with Article 29 of the JCPOA. Because no countries that were signatories to the JCPOA have the right or are allowed to corrupt in any shape or form the conducive environment that has been formed in result of the JCPOA. So those complaints, those grievances, will be transmitted to our counterparts. And those issues that we feel, those actions that have taken place that go against the spirit and the letter of the JCPOA will also be spoken of. Our expectation is this: all of the JCPOA signatories, number one just as Iran has, must remain 100 percent resolute and within the framework of their commitments because Iran did not adhere at a level of 99 percent. Iran has adhered at a level of 100 percent without equivocation. So our expectation and our wish is for our counterparts to do the same. To maintain the same level of firm, unequivocal commitment. And if there are problems somewhere along the way, there have been intransigence witnessed, those must be cleared up and they must live up to their commitments within the JCPOA. Regarding the first part of your question, in which you spoke of a possible scenario of the European Union to convince Trump, it is of course so because the Europeans have announced as much. The JCPOA has no other conditions, it is the JCPOA in its current form. End of the story. It must be implemented as such. Now, if we wish to speak about an issue with the Europeans or others, that has nothing to do with the JCPOA. It is completely disconnected. So for the Europeans to tell America to remain in the JCPOA in exchange for convincing and bringing to the table Iran to negotiate about other topics, that is not founded in reality. Now, the JCPOA is being implemented. If our friends in the European Union are keen on speaking with us about something, we can talk- we're happy to talk to them about anything. We speak to them on a daily basis by emails, by letters, on a daily basis between different officials and leadership levels. So we have no issue with speaking or talking about one another, but never can the JCPOA be a condition or pre-condition to or for anything. Well as far as Mr. Trump, you folks have a much better understanding of him and knowledge of him because you deal with him on a daily basis, but our interaction has been distant and limited for only a couple of days this year. You see, this important issue I would like to explain.The options that we say we have at our disposal, and we may choose one of those, is and will never be going towards nuclear weapons. No such option whatsoever. We have said it repeatedly and clearly that we see weapons of mass destruction and nuclear weapons as well against our religious standards, and you are all aware that the Supreme Leader of the Revolution has clearly, without equivocation, condemned in the framework of a religious edict, condemned the production, obtaining, selling, transferring, or using any of these types of weapons of mass destruction, including nuclear. What Mr. Trump alluded to yesterday was a complete baseless accusation. Iran has never sought nuclear weapons, will never seek nuclear weapons, is now not seeking nuclear weapons. The topic at hand should be enrichment. We are talking about enrichment, not building an atom bomb. Even in Japan today they have enrichment, and with this enrichment their power plants are receiving the needed fuel through enriched uranium. Now we do have a nuclear reactor in Bushehr which we, on a yearly basis, are purchasing the fuel for this reactor from Russia. And the time for this continuous purchase is coming to an end because we are in the frame work of a ten year purchase agreement with them. So if we can produce the needed fuel in Iran, then we can of course have the needed fuel for this reactor at our disposal. So the conversation is not whether we will go towards the direction of weapons. Iran has never sought, is now not seeking, will never seek weapons. An option may be to re-start enrichment. You do know that there is a twenty percent level enrichment for the Tehran reactor and the other type is three and a half to perhaps 3.6 percent enrichment for the reactor in Bushehr. Therefore, the conversation is about enrichment and never ever at all towards nuclear weapons. Vis-a-vis the accusations leveled against Iran as far as terrorism is concerned, of course this accusation is nothing new for us unfortunately. In the past, some leveled the same accusations against us. But allow me to ask you, which governmetns were the ones that created al Qaeda? Who were those entities that formed the Taliban? Who were the individuals and governments that supported Daesh (ISIS, the Islamic State)? Who were the countries? Who gave needed petroleum to Daesh? Who purchased the needed petroleum from ISIS that was illegally obtained from the people of Syria? Who were those who bought historic and archaelogical remains from Iraq that were priceless from Daesh? Who were the ones that stood against them resolutely though? Fought against them in Baghdad, Mosul and tens of other cities throughout the region were freed from their savage grasp. So a logical and fair answer to this question would clarify what yesterday was uttered by the President of the United States in his speech, how could close the expressions and sentiments are to reality. How unreasonable and unfounded those expressions were. Well, in the region, in our region, we see today that we are facing many challenges. So the United States of America should tell the American people, what has the government done for that region? After the tragic terrorist acts of September 11th, since that date, the United States of America, under the auspices of the fight against terrorism, what real fight against terrorism has it conducted? Has Afghanistan become safer? Has Iraq become safer? Has the region as a whole become safer? Or, did they create for the people in the region worse conditions and unsafe conditions? And the people of America should ask the government of America, how much of our nationa treasure, of our tax money, have been spent for fruitless wars in that region? So whomever brings their armies to our region, whomever sparks war in our region, whomever has formed and supported terrorist groups in our region, is in no position to levy such accusations against the Islamic Republic of Iran. And it must be able to respond first, to the accusations based on fact, levied against it. In Iran, we have been the victims of terrorism. 17,000 in the year 1981 and 1982 were lost to terrorism. 17,000. We are a nation, whom from day one, based on the demand of the people and the government of Iraq, and the people and the government of Syria, we have rushed to their aid. And we have stood shoulder to shoulder next to them in the first lines of fighting against terrorism, and we will continue to do so. When Daesh was about to attack and overrun Baghdad, we rushed to Iraq and defended Baghdad shoulder-to-shoulder next to Iraqi armed forces and the same in Irbil in order to repel the ISIS attacks. Doesn't matter for us whether its Irbil, Karbala, Baghdad, or Najaf, or any other city. If a city, a central population, is going to be attacked by the terrorists, we will defend them with all of our might, and we don't differentiate, we don't see these differences, and it's not right for someone to say, "Iran only helps Shiites or Sunnis." If Daesh is attacking folks in a Christian country and that government and those people ask us officially for our help, of course we will rush to their side, because it is our duty, it is our humanitarian responsibility, it doesn't matter if that population is Christian, Muslim, Jew, Shiite, or Sunni. The issue of Yemen is an incredibly heartbreaking issue. And it's a tragic issue. And we have spoken about Yemen with many leaders, whom I've met throughout the last two days. We held discussions about Yemen. Yemen has faced multiple, simultaneous tragedies. First, in Yemen, terrorist groups, such as al Qaeda are active in various parts of Yemen. This is the first issue and problem in Yemen. The second issue is that there is problem between the Yemenis themselves. And there are different opinions. And there are different ideologies. The third issue is that Yemen has been the targeted of merciless aerial bombardments of Saudi Arabian and United Arab Emirate air forces. And on a daily basis, Yemenis are being killed. And unfortunately, there is no sound uttered from the United Nations, from the United Nations Security Council, or anywhere else. And the last issue is that in the last few months, very dangerous, transmittable diseases have started to show their head in Yemen and many have lost their lives due to these illnesses in Yemen. And in our opinion, the first step, vis-a-vis Yemen, is the issue of ceasefire. It should be the objective of ceasefire. Stop the aerial bombardments. Stop the war. And when it comes to al Qaeda and other terrorist groups, they must be resolutely defeated and intra-Yemeni dialogue must be started, supported, and nurtured. And ultimately under the auspices of the vote and opinions and wishes of the Yemeni people, a new government must be constituted. These are the steps to be taken. But when it comes to other nations, upon which you have touched, Palestine and other nations there are similar issues and atrocities taking place. There must be solutions offered by all, including the UN Security Council, other international institutions. For our share, we have kept up with political efforts and humanitarian efforts, and we will continue to do so. After the JCPOA, the banking relationships between Iran and many countries including the European Union began. Our banking relationship are currently active with all of these banks and countries. Our petroleum sales and petroleum derivatives sales monies are deposited in their banks, transferred between their banks and our banks, financial instruments are issued, but we're talking about giving needed vast credit lines and needed participation via these credit lines to their enterprises for investment in our various sectors. Of course, they do say that there are various phases that they must go through in order to ease all banking restrictions, but overall our conditions today are in such as fashion that you do know with some Asian countries in the past two or three weeks, we have obtained over 25 billion dollar credit lines, from one country 15 billion, from another one 10 billion dollars, and very soon we'll announce an additional 10 billion dollar credit line from another Asian country. And in the coming weeks, a number of credit lines from European banks will also be announced. You do know that many European companies have started great investments in Iran, one of them is Total, the petroleum company, started an investment of 5 billion dollars in petroleum and derivatives. So we do have banking relationships with Europe, we are expanding those banking ties, they are adhering to the JCPOA and their governments are committed to the JCPOA so our only grievance is about the topic of banking relationships and transfers because the banks have not adhered fully to their commitments. And we have talked about it several times, we are making improvements, and we do hope to overcome this hurdle. Well, fundamentally, a fractious way of thinking is not one that is in line with the logic of Islam. We recognize all of the different beliefs of Islam as Muslims. We do not differentiate between Sunnis and Shiites. In Gaza, for example, we support the Palestinian people, there has never been an issue that the bulk of them are Sunnis it doesn't matter, they can be Sunnis or Shiites. The groups that are in Gaza Strip or in other Palestinian territories we defend them and we support them, we support Muslims in Pakistan be they Sunnis or Shiites. There is no difference for us. With the people of Iraq, both with their Sunnis and Shiites as well as their Kurds, we have extremely good relationships. Of course the Kurds, when it comes to their percentage of Sunni to Shiite, the great majority are Sunnis. But the last point you touched upon was somewhat strange. You said that Sunnis in Iran don't enjoy rights? You do know, or you should know at least, that Sunnis were the highest participants of, as you said, religious minorities in the latest presidential elections and they gave me the highest rate of votes than in any other previous presidential elections. They have representatives in the Islamic Consultative Assembly. We have provincial governors who are Sunnis, we have presidents and vice presidents of enterprises, there are ambassadors who are Sunnis. Again, my reiteration on the first day of the new administration was to give more managerial duties, high posts, to religious minorities are you said as well as to the youth as well as to the women in our society and lately I have sent a directive to all ministries that all ministers must choose two of their assistant ministers to be either from the youth or women or minorities and ethnic backgrounds. So in Iran, it's not as you said. The Sunnis are free, active, equal rights citizens in Iran. Their religious ceremonies are held freely, and we, when it comes to rights of citizens, we do not differentiate between Sunnis and Shiites. And one of my main points was the implementation of rights of citizens, citizens' rights, and again everyone from any faith or religion enjoys equal rights. Vis-a-vis the prisoner that you spoke of, there are folks imprisoned, Iranians imprisoned in Iran, and there are Iranians imprisoned in America, and as far as the folks that you have named, the person individual that you have named, because Iranian law under the constitution does not recognize dual citizenship, we consider them Iranians only. So those files are under the purview of the judicial branch, but from a humanitarian standpoint, and as far as complete adherence to the constitution, which is one of the main responsibilities of the president, and if the president anywhere sees an incorrect implementation of the constitution, the president has the right to step in. Now, we do hope that within the framework of the law, the various steps and phases can be gone through, and if you ask me on a personal basis, it is my wish, it is my dream for all prisoners everywhere to be free. We are never against the freedom of any prisoners. I do hope that you folks start caring the same sentiments for Iranians who are unjustly imprisoned or being prosecuted in America. And I always ask the same, and I always get the same question from you esteemed reporters and journalists. They always talk about those folks who are imprisoned in Iran, but no one ever says, "Dr. Rouhani, have talked to such and such," we have undertaken various types of actions to address the plight of the Iranians imprisoned in the US, now let's talk about those imprisoned in Iran. So again when it comes to humanitarian issues we have double standards to say the least, and that's not constructive. We must think of all prisoners, we must think in humanitarian terms, towards all of those who have been unjustly detained and imprisoned. We must see everyone equally, but unfortunately we politicize these issues, and that's very bad. So if an individual is imprisoned in Iran and some folks are outside of Iran and wish to use the current situation of that prisoner towards their political aims, that's a mistake. Generally speaking, when it comes to human rights, we must all set our best foot forward, and strive in order to render the aid to those who truly deserve our attention and aid. Well, ordinarily in the United Nations and the various members of the United Nations, when it comes to humanitarian issues, they do not see eye-to-eye, vis-a-vis world events. And therefore, they do not take equal action and their sentiments are therefore different. If a bomb goes off in Asia and some are killed, there is one set of reactions. If it goes off somewhere in the Middle East and a number are killed and the reaction is different as well. However, if that explosion occurs in Europe or in America, then the reactions are different and the positions taken thereafter are different as well. So unfortunately, we do see these varying standards applied to the same sets of circumstances when it comes to humanitarian issues, unfortunately. However, the current tragedy in Myanmar, were it taking place in a European country, the entire topic and issue would be spoken of very differently. Much more loudly than it currently is. And we all must strive, when it comes to human being, innocent human being, impoverished human being. They're all equal no matter where around the globe they are from. Whether they're Muslims, Christians, Jews, Asians, Europeans, Americans, it really doesn't matter. No matter where they are from or what ethnic background they are from they are human beings. And we are all the same. There is no difference between us.